Bathroom 2 is in a self contained building - great if you are sandy from the beach and don't want sand all over the house. We would prefer guests not to smoke in the house. The house is cleaned before visits. If required, the maid can come more frequently, but this must be arranged beforehand. The garden is very large and there are a number of terraces providing opportunities for separate families, or members of the same family, to have space for themselves. The house is just above a fresh mountain spring. Choice of 2 huge terraces in the sun, with shade or shelter - and always a breeze. Dramatic views over the sea, the big Eucalyptus tree, a dramatic focus for the house. A most generous and extremely well organised and clean place. We highly recommend it as a base for discovering the small hidden beaches of the island ( Zorkos, Vitali, Ateni and Achla ) and fascinating walks along river valleys. We really loved staying here. The house has lovely views and lots of different terraces and places to be with beautiful views out over the valley and sea, stunning sunsets and shade and breeze when you want it too. Inside the bedrooms and bathrooms are attractive, comfy and well-equipped. The kitchen is large and well arranged, there's everything you need in it to cook and feed a house full. There are also lovely local items dotted around, and lots of information, books and maps about the island. With the owners' knowledge of the island and the advice they provide its easy to find lots of lovely quiet beaches with and without tavernas, places to shop for food, great walks (even in high summer), restaurants. Just spending time around the house, on the terraces under the Eucalyptus tree and generally enjoying the place was also a pleasure. The owners were really helpful and very easy to deal with, they are very passionate about Andros and are really keen to help people enjoy their stay and the island. As the house is about 20 minutes drive from the arrival port of Gavrio this is a great location for exploring the wild north of the island and still being able to quickly get into the shops and restaurants of Gavrio and other parts of the island, watersports etc. Its also a beautiful house with lovely original features in a great setting. For us it was a perfect base and a really good way to experience a lot of Andros in a short period of time. I loved my time at this wonderful spot on Andros. Beautifully situated high up on the hills, it commands amazing views and sunsets which are breathtaking from the terrace. A short drive to the closest village and easy driving distance to amazing beaches. It is surrounded by lots of fig trees which were just ripe during our stay - lots of varieties and absolutely delicious. A little walk down the steps and along the road, you can get to a little spring which has wild mint growing - a great place to explore from on foot with walks up the hill and around the area. Loved the house - the rooms were comfortable and clean and freshly painted white. The kitchen is really well set up and the living area really cosy. 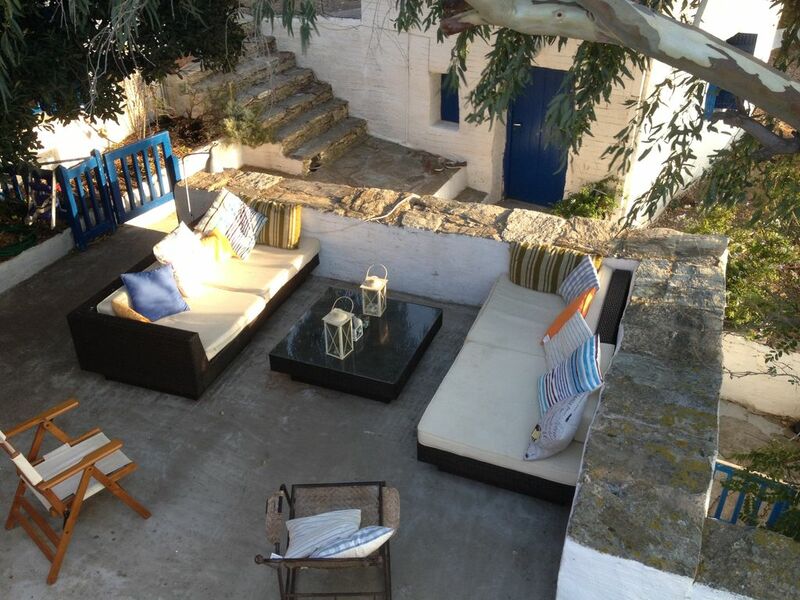 Particularly loved the terrace for a 'greek' breakfast or g&t's at dusk to watch the setting sun. I will absolutely be coming back....thank you! I always stay here because I love this place. The kitchen has everything you need, the house is clean, the sheets are beautifully ironed and you feel like you are in a real Greek home. Inside the house it's always lovely and cool (the walls are so thick). There are showers, baths, and comfortable bedrooms. From memory, all are curtained and shuttered, and I sleep better in this house and Andros than anywhere else.! Outside, there are lovely orchards and grassy areas on different levels to relax. The owners are always really friendly when I book and have always recommended good places to go and companies to use. What to do: there are so many beaches that we normally go to a different one each day. Some have little restaurants nearby where you can spend a couple of shady hours; others we take a picnic too, and glory in the fact there are still some beaches in Europe with no bars, parasols or disco. Andros is a truly unspoilt island. My favourite morning activity is to drive in to Gavrio, pick up fruit and vegetables from the farmers who arrive daily and sell groceries from the back of their trucks, then supplement it with visit to the supermarket and green grocer, before selecting one of many cafes for my morning greek coffee. In the evening, we probably eat in 25% of the time and enjoy really cheap greek wine, gorgeous fruit and vegetables with some fish or cook up a bolognese; but there are also great restaurants - in Gavrio there are lots the facing the port, but also on little squares. Just up from the house is a fabulous restaurant. I have no idea what is called (we just call it the "goat" restaurant ... for no known reason), but just turn right out of the house and its about a kilometre up the hill off the road to the left. The food is really delicious...we have often had to place a second order for more! Children queue up to ride on the ponies that come out in the evening, and all is very safe, quiet and idyllic. - there is a spring nearly opposite the house which we ran down to each day to fill up the bottles with the purest water that runs from the mountains. La maison de Tim est encore plus belle que sur les photos! La terrasse, en particulier, nous a enchantés; elle est grande, conviviale et protégée par un bel eucalyptus qui, secoué par le meltem (qui a été incessant pendant notre sejour), projette sur elle de très belles taches de lumière. On assiste à des couchers du soleil somptueux. La maison comprend cinq chambres. L'une d'entre elles possède un lit XXL, et une autre, un peu à l'écart, est parfaite pour isoler de grands ados parfois bruyants! Il ne faut compter que sur deux salles de bain car la troisième, dans le jardin, est un peu spartiate. Grâce aux explications de Tim et Lully nous avons trouvé la maison très facilement. Toutes leurs recommandations concernant les plages et les tavernes étaient de bons conseils. Parmi les plages les plus proches, nous avons apprécié celles de Felos et, plus encore, de Sorkos. Mention speciale à la taverne "THIRIOTROFEIO" BISTROT située à Gavrio et, plus loin, à Andros, le restaurant de fruits de mer Nonas. Si nous devions retourner à Andros, nous souhaiterions revenir dans cette maison chaleureuse. La casa è molto caratteristica, con due terrazze piacevoli e spazio sufficiente per ospitare due famiglie di 4 persone ciascuna, garantendo anche una buona privacy. La posizione è comoda per raggiungere Gavrio ed alcune delle spiagge migliori dell'isola. La casa è fornita di tutto il necessario per cucinare e la fonte di acqua potabile è a 2 passi. Lully e Tim sono stati molto cortesi, fornendoci tutte le informazioni utili sull'isola e la casa. The island of Andros is now the closest Aegean island to the new Athens International Airport. A 30 minute bus ride takes you to the port of Rafina where ferries leave for Andros, a two hour journey. The next two islands in the group are Tinos and Mykonos. All ferries to Andros dock at Gavrio which is about a 15 minute drive from the house. Andros is the greenest Cycladic island, even in the summer, fresh water flows on the island and there is plenty of greenery. Being slightly off the beaten track, visitors can enjoy this traditional Greek island and relax on its near empty beaches. There are plenty of sandy beaches on the west side of the island, the nearest of which is only 10 minutes drive from the house. On the east side there are perfect white pebble beaches with the clearest blue seas we have ever seen. We have 4 children ranging from 2 to 14 and have found that there really is something for everyone. This is one of Greece's best kept secrets. We can accept payment in Euros or Sterling. There is a deposit of 10% of total price payable on booking. 50% due 60 days before arrival and then the remainder 30 days before arrival.